Join us as thousands of Jews gather at Kever Rachel, without ever leaving home. LIVE FROM KEVER RACHEL. Tune into WCMA 570 AM. This motzei shabbos November 8th, 11 cheshvan. The yahrtzeit of Rachel Imeinu. From 12am to 2am EST.Live webcast at keverrachel.com. 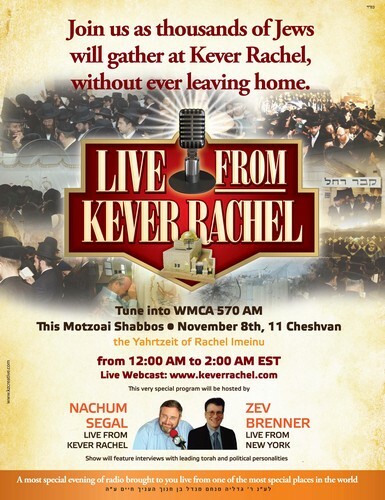 This very special program will be hosted by Nachum Segal live from Kever Rachel and Zev Brenner live from New York. The show will feature interviews with leading torah and political personalities. A most special evening of radio brought to you live from one of the most special places in the world.